#EyeSeeYou2016: Snap, Share & Win! Congratulations to our contest winner, @SoacSue! The International Federation on Ageing would like to thank all participants for their entries. Check out the album below to see some of our favourite submissions! The International Federation on Ageing is inviting amateur and professional photographers across Canada to join us in celebrating eye health this holiday season. Tweet a photo of your favourite holiday sight using the hashtag #EyeSeeYou2016, and you will be automatically entered to win a brand new pair of Ray-Ban sunglasses, valued at $175. 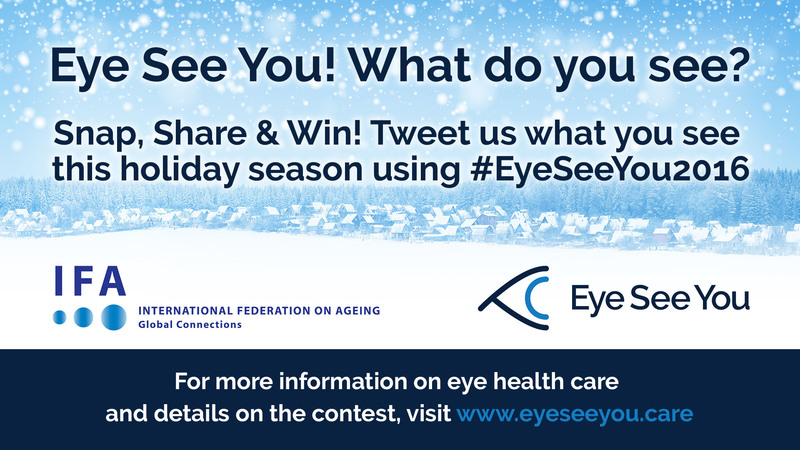 To participate, simply Tweet or post a photo on Facebook of your favourite holiday sight using the hashtag #EyeSeeYou2016. You will then be automatically entered to win a brand new pair of Ray-Ban sunglasses, valued at $175! The IFA (@IntFedAgeing) will be retweeting/reposting all submitted pictures. Please note that if you are entering via Facebook, you must adjust the privacy settings of your entry post to “public” in order for the image to be visible to the International Federation on Ageing Facebook account. To learn how to adjust the privacy settings of a single post, visit these instructions. All images submitted must have been taken by the person submitting the entry. Participants are able to submit a maximum of 3 photos. If more than three photos are received, only the first three photos submitted will be eligible to win. You have from December 19, 2016 to January 2, 2017 to submit your favourite photos. On January 6, the photo that is most visually appealing and shows the most holiday spirit, creativity, and originality will be selected as the winner. All photos submissions must be made by Canadian residents who are 18 years or older. For more information, and to view full contest rules, click here.